Even as the number of occupants continues to grow in the heart of the city, finding the kind of outstanding urgent care Downtown Los Angeles residents need and deserve has grown more difficult. Fortunately, Dr. Michael Farzam of House Call Doctor Los Angeles is proud to be one of L.A.'s very few working house call doctors, providing outstanding, personalized care in the safest and most user-friendly setting possible: the patient's own home or office. Whether you are feeling poorly and don't want wade through deal with an overcrowded urgent care in Downtown Los Angeles, or are suffering from a chronic issue that requires treatment but simply haven't been able to find time to make it to a doctor, Dr. Farzam is delighted to visit you at home, your office, a film set, or just about anywhere else you are likely to be. Finding good doctors on call in a clinic in L.A. is one thing, but finding an outstanding doctor willing to meet you wherever you might be is a rare thing indeed. 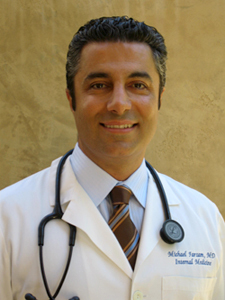 No wonder Dr. Farzam has become known as first choice for urgent care Downtown Los Angeles residents turn to. Many of Dr. Farzam's patients formerly assumed that doctors who make house calls simply didn't exist in the 21st century, but have been thrilled to be proven wrong. They have been even more delighted to learn that home urgent care in Downtown Los Angeles can be surprisingly reasonable in terms of cost – in fact, depending on an individual's personal insurance situation or lack thereof, a visit with Dr. Farzam can be significantly less expensive than a trip to the emergency room. Wherever you are in the Greater Los Angeles area, Dr. Michael Farzam is ready and able to provide you with outstanding medical care in the safest and most comfortable possible setting – wherever you already are! To find out more, please call 310-849-7991 today or visit our contact page.